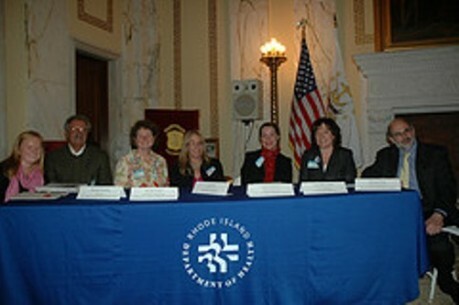 The Department of Health held an event at the State House on November 15, 2011 to celebrate the work of our community partners in improving the health of residents living throughout the non-metro regions of Rhode Island. Event activities included a panel of local and regional rural health experts that addressed unique issues surrounding provision of care in non-metro areas. The panel was led by Michael Fine, MD, Director of Health and included members: Meghan Grady, YWCA Northern Rhode Island; Marion Pawlek, New England Rural Health RoundTable; Susan Orban, Washington County Coalition for Children; Deirdre Denning Norton, WellOne; Susan C. Jacobsen, VNS of Newport and Bristol Counties; Lynn P. Blanchette, Scituate Health Alliance.